The US dollar has been consolidating its gains after recent sessions have sent it to multi-month highs across the board. The Japanese yen has been suffering particularly much as the Bank of Japan governor Haruhiko Kuroda expressed unfounded optimism about the development of the Japanese economy going forward. The USD/JPY binary options forex pair has opened around 104.06 today. As the European open was drawing closer, the pair has experienced a stark decline toward the lower part of the range, ultimately finding a base at 103.80. The consolidation persisted in the next couple of hours. Even the release of much better than expected durable goods orders out of the US did not bring to the fray renewed buying of the Greenback. 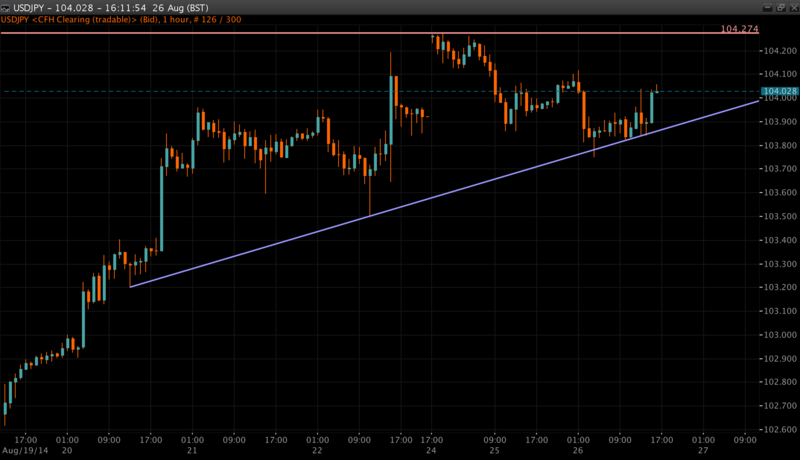 Instead the pair spiked higher to 104.03 on the news and has subsequently dropped back down towards 103.85. It was only after the release of much stringer than expected consumer confidence data from the US conference board that we have seen a spike in activity with stock prices hitting new all time highs and the USD/JPY pair following on the increased risk appetite on the markets. We are currently recommending to take daily call positions in this pair on any approach towards the 104.00 level. After we see additional buying materializing we are of the opinion that it is very likely to see a close above 104.00, even 104.10. On the flip side, if we see a decline in prices towards the base set earlier today, we could see a much more protracted decline in the value of the USD/JPY binary options forex pair. Hence we are currently recommending to buy daily put options should the prices close below 103.90 on an hourly basis.